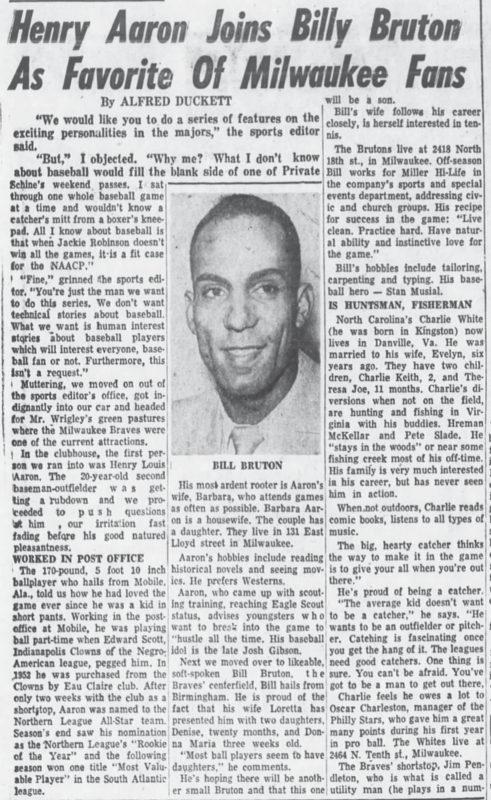 Here is a clip from the New York Age, dated June 26, 1954–63 years ago today–in which catcher Charlie White of the 1954 Milwaukee Braves credits Oscar Charleston with coaching him up for the big leagues (click on the image to get a larger version; White talks about Charleston toward the bottom of the third column). White had several black teammates on that Braves team, including, as we see here, one who was quickly becoming well known in the young Henry Aaron. Aaron played only for a few weeks on the 1952 Indianapolis Clowns, if I’m not mistaken, before being sold to the Braves. Charleston never managed him, but he may have managed against him, since he was managing the Philadelphia Stars in 1952. I haven’t yet researched the matter. Anyway, White, who played for the Braves in both 1954 and 1955 before his brief major-league career came to an end, was one of those young men in whom Oscar could take pride in helping get to the majors before he died in October 1954. The individual mentoring role seems to be one in which Oscar particularly excelled as a manager (as opposed, say, to strategy).